Projection TV's are great for people looking to bring the theatrical experience into their homes. Rear projection TV's are the most popular, but they're limited in the screen size and they tend to be hulking beasts that take up a huge chunk of your room. 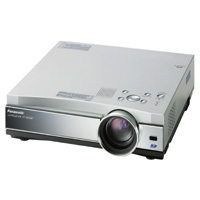 Our reference 57 inch rear projector, for example, is nearly the size of a small car. So if you want a truly gigantic screen, or merely a big screen that doesn't have a big footprint, you need to look at the front projection market. Such as this Panasonic, the model PT-AE300U which, as is the trend today, is about the size of an old fashioned slide projector, but which offers a pretty decent picture considering its relatively low price. This $2,999.99 US/$4399.99 Cdn. unit can be floor (or desk, or whatever) or ceiling mounted; we'd recommend that if you're getting such a unit that you mount it from your ceiling, up out of the way and where you're less likely to walk in front of its beam, throwing your shadow onto the screen. Since we were only testing the unit for a short time we couldn't do that, alas, so we put it on a coffee table in one of our home theater rooms and aimed it at a portable screen we had for the purpose. The result with our temporary setup was that we could project an image up to about 70 inches diagonally, which is certainly big enough to be enjoyable but doesn't come anywhere close to the Panasonic's potential 200 inch screen size. And boy, did we wish we could have exploited the full 200 inches! Anyway, the Panasonic (as, indeed, are most LCD projectors like this) is very easy to set up. All it takes, really, is to unpack it from the box set it where you want and then aim it at the screen. Of course, ceiling mounting is more involved, since it's a permanent installation that must be wired and secure enough to ensure the projector doesn't drop onto your head! Hooking up your video signals' sources is also straightforward, and the Panasonic's inputs are very flexible. It accepts DVI digital, PC, component video (for DVD or HDTV), S video, and old fashioned composite video. You even get a smart media card slot you can use for slide shows and the like. There are also stereo audio inputs, for the times you may want to use the unit's built in speaker. I can't imagine why you'd want to use the speakers for home theater use, but remember that this projector can also be used in professional applications such as for displaying presentations at trade shows where the speaker could come in handy. You don't get a typical cable TV connector, but since this projector doesn't have a tuner anyway this doesn't matter. And don't think think that the lack of a tuner is an oversight; it isn't. This is a monitor, not a TV, and monitors generally don't have tuners. This gives you the flexibility of hooking in whatever type of tuner you may want, whether freestanding, from a VCR, cable box, HDTV, or satellite receiver. Once the unit is hooked up, and don't forget that you'll need some pretty long cables to reach the projector from your audio/video system, the actual setup of the projector itself is also very easy. You use a series of straightforward onscreen menus accessed by the Panasonic's very small remote control. Setup options include front or rear projector (for such applications, not usually home theater-related, where you mount the projector behind the screen), the abovementioned ceiling or desk mounting, and the usual variety of picture control settings such as color, tint, sharpness, etc. The owner's manual also gives you a chart showing how far back to put the projector to get a particular screen size, and this is very handy. It shows, for example, that for a 16x9 screen size of 200 inches, you need to set the projector at least 20 feet, four inches back (which is actually a pretty good "throw distance"). Take this into consideration when designing your room! Operation of the projector is also very easy. There's a minimal but sufficient set of buttons on the unit itself and the straightforward remote control, the latter of which lets you access any of the features. Setting up the picture includes the welcome keystone feature. You use this to ensure the picture is the proper rectangle shape (whether 16x9 or 4x3) when the projection location and angle tends to distort the picture. If the screen is higher than the projector, for instance, the top part of the projected image will be larger than the bottom part. Keystone adjusting will return it to its proper rectangular shape. Adjusting is easy, via an onscreen menu. So how does it look? Well, I tried it with 480i DVD, a PC, and both standard and high definition satellite receivers - and overall I was quite happy with it. The worst performance came from PC and, to be fair, could have been a driver issue with the computer we were using. DVD's looked very good, as did the satellite. And while the PT-AE300U doesn't really offer true 1080i high definition (it doesn't have enough pixels for that), the 1080i picture we fed it looked very good. Black levels were fine for an LCD, colors were well saturated and defined, and there was little of the pixilization that plagued earlier generations of LCD projects and make it look as if you were watching through a screen door. The unit features 500:1 contrast ratio which, while not the best in the industry, is competitive in this market segment. On one 4x3 aspect ratio, black and white movie we did notice some pixilization at times, and there was a little yellow spot near the top right of the screen, but this was minor and we didn't notice it with any other programming. One thing we loved was the variable aspect ratio control. This Panasonic lets you watch 4x3 sources in 4x3, without having to stretch or zoom the picture or risk burning in gray bars to each side. You can also use it in 16x9 of 4x3 at a shrunken setting that would be perfect for such space-challenged applications as small home theaters, trade shows, etc. Picture settings include a variety of modes (normal, cinema, etc.) and you can set color temperature, white balance (when using PC's) and then save your optimal settings in memory. One thing you should remember with a front projector is that controlling your room's light is very important. While this Panasonic boasts a light output of 800 ANSI lumens (which isn't the best in the industry but was plenty bright enough in our installation), and works quite well with some room light on, you won't want to put it in your sun room. Another consideration with LCD projectors is lamp life. While CRT projectors don't require you to change lamps (they just fade slowly over the years), LCD's do. But once you do replace the lamp you're back to original spec, so this isn't as bad as it sounds. Panasonic says the lamp life for this unit is rated at 2000 hours and they recommend the lamp be changed by a qualified technician (otherwise you might burn in hell, we assume). Another thing to remember is that these units also include a cooling fan, much as a PC does. We were quite impressed with the fan in the PT-AE300U; it was very quiet. In fact, our temporary installation was near a PC and the computer's fan was far, far louder than the Panasonic. The 300U accepts 480i, 480p, 720p and 1080i signals. Despite its pixel count being 960 x 540, which means it shouldn't offer true HD capability, Panasonic (via the user's manual) says it does. We have no way of proving or disproving that, but as mentioned above the picture quailty when we threw it 1080i (and 720p) was very good. We wished we could have tried some really spectacular screen sizes with the Panasonic, but space and time considerations prevented that. We have no reason to think that the unit won't offer a very satisfying giant screen picture, however. Some of the DVD test material we used included Star Wars Episode II: Attack of the Clones and Monsters, Inc. and even though we weren't using a progressive scan player at the time, we were quite happy with the picture. As insufferable video snobs, we think we'd rather opt for a higher end projector if were were making a permanent installation, but think that for the price this Panasonic offers very good performance and value.